The Coast Guard Cutter Eagle, America’s Tall Ship came to Dublin on Thursday, May 26th at 1:30 p.m. Eagle will moor up at Sir Rogerson’s Quay Wall and will remain open for free public tours through Monday, May 30th. Thursday, May 26th: 3:30 p.m. – 7 p.m.
Friday, May 27th: 10 a.m. – 2 p.m.
Saturday, May 28th: 10 a.m. – 7 p.m.
Sunday, May 29th: 10 a.m. – 7 p.m.
Monday, May 30th: 10 a.m. – 7 p.m.
At 90 meters (295ft) in length, Eagle is the largest tall ship flying the stars and stripes and the only active square-rigger in United States government service. Constructed in 1936 by the Blohm and Voss Shipyard in Hamburg, Germany, and originally commissioned as Horst Wessell by the German Navy, Eagle was a war reparation for the United States following World War II. 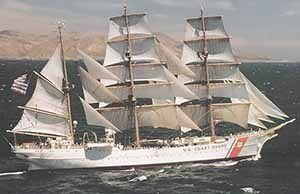 Eagle is a three-masted barque with more than 6797 square meters (22,300 sqFt) of sail and 9.7 kilometers (6-mi) of rigging. Eagle has served as a classroom at sea to future Coast Guard officers since 1946, offering an at-sea leadership and professional development experience as part of the Coast Guard Academy curriculum. During this sail, Eagle also hosts cadets from the Royal Malaysian, and Honduran Navies who, after they graduate with a 4-year degree from the U.S. Coast Guard Academy, will return to their respective countries to share the lessons learned with their services. The last time Barque Eagle visited Dublin, Ireland was 1996. After 20 years, Eagle is crossing the North Atlantic to visit this historical city again. After departing Dublin, Eagle will set her course for London, England. For a continuous stream of information about Coast Guard Cutter Eagle, including port cities, tour schedules, current events and cadet and active duty crewmember photographs, follow the “U.S. Coast Guard Barque Eagle” Facebook page.